Please Consider the Markit Germany Retail PMI® Report. 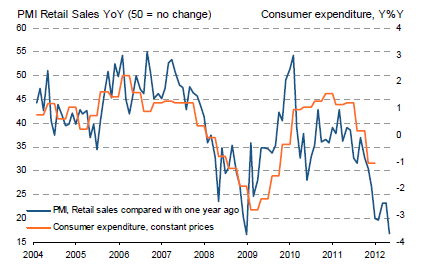 Fastest drop in retail sales since April 2010 as year-and-a-half run of growth comes to an end. Lower sales and strong market competition resulted in a sharp and accelerated decline in margins across the German retail sector. The latest fall in margins was seventeenth in consecutive month and also the steepest for two years. Please Consider the Markit France Retail PMI® Report. French retailers reported a sharp reduction in sales during April. 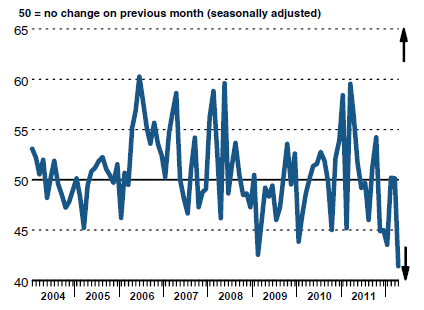 The month-on-month fall was the most marked recorded by the survey since data collection started in January 2004. Sales were also down considerably on a year-on-year basis, while previously set plans were again missed. The weak sales performance occurred despite evidence of substantial discounting and promotions among retailers, which resulted in a further steep drop in gross margins. 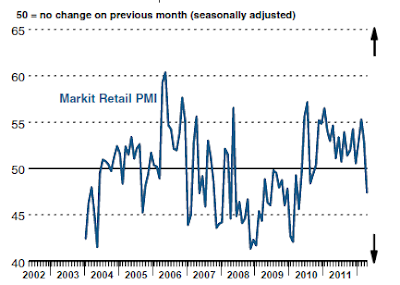 The headline Retail PMI® plunged to a series-record low of 41.4 in the latest month, from 50.2 in March. The latest reading was below the neutral 50.0 mark for the first time since January and indicative of a steep month-on-month decline. The extent of the latest failure to meet targets was the greatest for one-and-a-half years. Panelists are nevertheless optimistic that sales will exceed previously set plans in May. Factors expected by retailers to boost sales over the coming three months include the end of the presidential election, summer weather, promotions and new products. Note the absurd level of optimism by French retailers. Please Consider the Markit Eurozone Retail PMI® Report. Plunging to its second-lowest level on record in April, the PMI hit 41.3, down from 49.1 in March. The latest figure signaled the largest monthly fall in retail sales across the single currency area since the depths of the global financial crisis in November 2008 (40.6). Eurozone retail PMI figures are based on responses from the three largest euro area economies. For the first time since September 2010, retail sales fell across Germany, France and Italy. The rate of contraction in Germany was the fastest since April 2010, while French retailers posted a survey-record drop as they reported disruption due to the presidential elections. Italy continued to see the steepest overall rate of decline, however, as the pace of contraction reaccelerated to approach the record level posted in January. The annual rate of decline in Eurozone retail sales was also one of the strongest since the survey started in January 2004. Sales have fallen on an annual basis each month since last June. 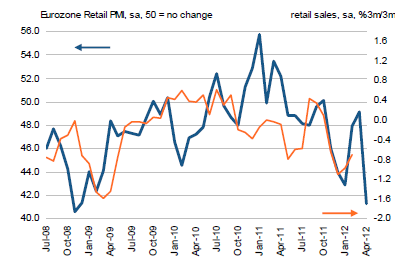 Please Consider the Markit Italy Retail PMI® Report. The seasonally adjusted Italian Retail PMI® – an indicator of month-on-month changes in total retail sales – fell to the greatest extent in survey history in April, dropping from 42.4 in March to 32.8. This sharp and accelerated decrease in high street spending was the second-fastest since December 2008, and extended the current sequence of contraction in the sector to 14 months. primarily attributed by survey respondents to lower sales and rising input costs. For months I have been reading the apologists at Markit (and elsewhere) predict a short, shallow Eurozone recession. “A slight easing in the rate of decline of the Eurozone service sector was insufficient to offset the first decline in manufacturing output for three months, causing the overall economy to contract again in March. “With the exception of a marginal expansion seen in January, the economy has been in continual decline since last September. Although the average rate of decline seen over the first quarter eased compared with the final three months of last year, the survey data nevertheless indicate that the region has slipped back into a technical recession. I have been critical of Market analysis for months and this is the worst yet. First they said Germany would prevent a recession, then Germany would decouple, now they suggest this is only a "technical" recession and the "the recession may be mild and brief". The European recession will be neither mild nor brief. Spain, Portugal, and Greece are in economic depressions with no end in sight. Spain and Italy (the 3rd and 4th largest eurozone markets) are poised for steeper slides. Germany will not be immune to this as I have stated for months on end. German manufacturing contracted in March and services sector will soon follow. For some reason, Markit economists cannot figure this out. This was extremely easy to predict, yet most blew it.